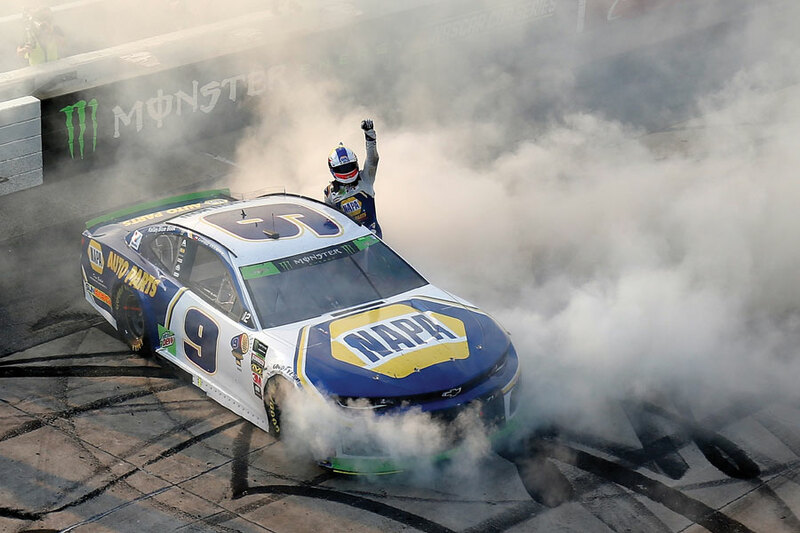 Last fall at Dover International Speedway, Chase Elliott led a race-high 138 laps and was poised to get his first Monster Energy Cup Series victory, only to see Kyle Busch pass him for the win with two laps to go. On Sunday at Dover, it was Kevin Harvick and Aric Almirola who were left empty-handed, as Elliott took control on a late restart in the Gander Outdoors 400 and led the final 11 laps to get his second win of the season and a guaranteed advance to the third round of the Cup Series playoffs. Harvick was the first to see his hopes dashed. A valve stem of a tire was cut during a pit stop on Lap 319 after he’d led a whopping 286 laps and won both stages. His Stewart-Haas Racing teammate Almirola quickly took over and led 64 of the next 75 laps and was four laps from victory when another teammate, Clint Bowyer, wrecked and brought out the caution flag. As Almirola and the rest of the leaders headed to pit road for fresh tires, Elliott stayed on the track and took the lead, but on worn tires. On the restart, Almirola, then running sixth, bounced off the wall attempting to take third place and triggered a five-car crash that collected four other playoff contenders — Brad Keselowski, Alex Bowman, Ryan Blaney and Martin Truex Jr.
After a brief red flag to clear the track, the green flag flew for an overtime run to the finish. Elliott took the lead from Denny Hamlin at the drop of the flag and sped away to get the win, with Denny Hamlin, Joey Logano, Erik Jones and Kurt Busch completing the top five. Elliott, who like his father, Bill Elliott, had eight runner-up finishes before scoring his first Cup win, said the lessons learned in past disappointments — like the one at Dover last fall — helped him seize the moment at Dover on Sunday. The decision by Elliott’s crew chief Alan Gustafson to stay on the track at the end meant that Elliott’s tires had 50 laps on them, while his challengers behind him had fresh rubber. But Elliott said he supported the call all along. While Elliott was celebrating, there was a mix of reactions from the drivers who saw their chances of victory at Dover slip away. Harvick recovered from his tire troubles to finish sixth and retain the points lead heading into Talladega, but Almirola finished 13th and dropped to ninth in the standings, outside the top eight who will advance after two more races. For Almirola, it was yet another opportunity to win that slipped away at the end, just like at Daytona, Chicago and New Hampshire earlier this year. Photo Caption: Chase Elliott emerges from his No. 9 Chevrolet after performing a burnout to mark his win at Dover.